9/11 Security Solutions - Meant to aid those seeking streamlined research into border security. The 9/11 Commission Border Security Library contains all materials from the 9/11 Commission and 9/11 Public Discourse Project regarding border security and terrorist travel from the 9/11 Final Report, a few of the most used excerpts from 9/11 and Terrorist Travel, hearing materials, report cards on progress, and transcripts. The Identity Document Security Library consists of legal, technical, and policy pieces regarding identity document security. The issue of identity, and information about identity, was at the underlay of the 9/11 Commission border work. ACLU Watch List Counter - In September 2007, the Inspector General of the Justice Department reported that the Terrorist Screening Center (the FBI-administered organization that consolidates terrorist watch list information in the United States) had over 700,000 names in its database as of April 2007 - and that the list was growing by an average of over 20,000 records per month. The list now has over one million names on it. Why are there so many names on the U.S. government's terrorist list? Al Queda Training Manual - Several commentators have observed that this manual appears to be a compilation of material drawn from various military, intelligence and law enforcement manuals for internal security, guerilla and covert operations around the globe, and thus is not unique for its alleged sponsorship by Al Qaeda - which is not mentioned in the manual. Al-Qa'ida (the Base) - History and links to articles. Al-Shabaab - Somalia-based cell of the militant Islamist group al-Qaeda. Also see NCTC page. Anti-Defamation League (ADL): Terrorism - Information on incidents of U.S. domestic terrorism and international terrorism. antiterroristas.cu - Provides up to date news, information and analysis relating to terrorism and acts of aggression against Cuba, as well as to the five Cubans unjustly incarcerated in the United States for defending their country against terrorism. Armenian National Institute - Includes a database on the historical evidence of the Armenian genocide. Baader-Meinhof: Germany in the Post-War Decade of Terror 1968-1977 - Extensive resources about this West German Terrorist phenomenon of the 1970s. Benevolence International Foundation (BIF) - A nonprofit charitable trust that is suspected to have supported international terrorists worldwide. It was known as the Benevolence International Fund in Canada and Bosanska Idealna Futura in Bosnia. Boko Haram - An Islamic jihadist militant terrorist organisation based in the northeast of Nigeria north Cameroon and Niger. Biosecurity and Biodefense Resource - Federation of American Scientists resource for biosecurity policy, bioterrorism information, and biodefense research. Boko Harem - Wikipedia backgrounder: The organisation seeks to establish a "pure" Islamic state ruled by sharia law, putting a stop to what it deems "Westernization." The group is known for attacking Christians and government targets, bombing churches, attacking schools and police stations, but also members of the Islamic establishment. From 2009 to 2013, violence linked to the Boko Haram insurgency has resulted in an estimated 3,600 killed, including 1,600 civilians. Because of the conflict, a state of emergency was declared in northeast Nigeria. Also see info at USIP and Global Security. British Secret Intelligence Service (MI6) - The Secret Intelligence Service (SIS), often known as MI6, collects Britain's foreign intelligence. The Service is based at Vauxhall Cross in London. Bureau of Diplomatic Security (DS) - The security and law enforcement arm of the U.S. Department of State. DS is a world leader in international investigations, threat analysis, cyber security, counterterrorism, security technology, and protection of people, property, and information. California Anti-Terrorism Information Center - Formed in the wake of the September 11 attack on the World Trade Center and the Pentagon to provide law enforcement with statewide intelligence support to combat terrorism. Canada: Listed Entities - These pages concern the list of entities as determined by the Government of Canada pursuant to the Anti-Terrorism Act, 2001. Canada's Anti-terrorism Act - The ATA was an omnibus piece of legislation containing major enactments or amendments to a number of federal statutes, including the Criminal Code, the Security of Information Act (amending and renaming the Official Secrets Act), the Canada Evidence Act; the Proceeds of Crime (Money Laundering) and Terrorist Financing Act, the Charities Registration (Security Information) Act, and the National Defence Act (setting out for the first time in statute the mandate of the Communications Security Establishment). Additionally, there were numerous (but significant) amendments to other pieces of legislation. Cargo Ship Terror Alert - Terror warnings from WN Network. Carlos the Jackal - Venezuelan terrorist convicted of murder in France who has worked with and for causes associated with communists, Arab nationalists and Islamists. Also see lengthy article by Patrick Bellamy. CBW Conventions Bulletin - News, background and comment on chemical and biological weapons issues. A quarterly journal of the Harvard Sussex Program on Chemical and Biological Weapons Armament and Arms Limitation. CDC Emergency Preparedness and Response - CDC's primary source of information and resources for preparing for and responding to public health emergencies. CDC: Emergency Response Resources - This page provides information to help protect emergency responders in the event of a terrorist attacks. It links to information on response to the World Trade Center attacks. This page also offers access to information on other important elements of a terrorism response such as Safeguarding Building Ventilation, Bloodborne Infectious Disease, Chemical Hazards and Anthrax. CDISS Terrorism Programme - Maintains a database of major terrorist incidents around the world, These collected incidents provide a snapshot of the wide-range of terrorist attacks and political violence experienced worldwide since World War II. Center on Global Counterterrorism Cooperation - A project of the Fourth Freedom Forum, is a nonpartisan research and policy institute that works to improve internationally coordinated responses to the continually evolving threat of terrorism by providing governments and international organizations with timely, policy-relevant research and analysis. Center for Infectious Disease Research & Policy - Research in infectious disease, SARS, chemical terrorism, anthrax, botulism, plague, smallpox, tularemia, VHF, agriculture and food security, irradiation, foodborne disease. Centre for Peace in the Balkans - Toronto based corporation whose members are actively engaged in the collection of information and materials related to the region with the goal of scrutinizing the reasoning and assumptions, both cultural and geopolitical, behind the West's flawed Balkan strategy and providing support and alternative solutions to the conflict management process in the Balkans. Also has Balkan terrorism page. Center for Strategic Communication (CSC) - An interdisciplinary group of scholars at Arizona State University and partner institutions who are interested in applying knowledge of human communication to issues of countering ideological support for terrorism (CIST), diplomacy and public diplomacy. Centre for the Study of Terrorism and Political Violence (CSTPV) - Independent academic research institute in the United Kingdom dedicated to the study of terrorism and related forms of political violence. Clive Stafford Smith - Founder and Director of Reprieve. In 2001, when the US military base at Guantánamo Bay was pressed into service to hold prisoners beyond the reach of the courts, Smith joined two other lawyers to sue for access to the prisoners there. To date, Clive has helped secure the release of 65 prisoners from Guantánamo Bay (including every British prisoner) and still acts for 15 more. Combating Terrorism Center at West Point - Maintains expertise in four primary areas: terrorism, counterterrorism, homeland security, and weapons of mass destruction. Council on Foreign Relations: Terrorism - Most recent articles on terrorism. Countering the Changing Threat of International Terrorism - Report of the U.S. National Commission on Terrorism, published in June 2000, concludes that the tactics and goals of the world's terrorist organizations remain low-tech. Countering the New Terrorism - Online text of book of the same title, written collectively by Ian O. Lesser, Bruce Hoffman, John Arquilla, David F. Ronfeldt, Michele Zanini, Brian Michael Jenkins. Published by RAND, 1999. Country Reports on Terrorism - U.S. law requires the Secretary of State to provide Congress, by April 30 of each year, a full and complete report on terrorism with regard to those countries and groups meeting criteria set forth in the legislation. This annual report is entitled Country Reports on Terrorism. Beginning with the report for 2004, it replaced the previously published Patterns of Global Terrorism. Department of Homeland Security National Response Framework (NRF) - The NRF presents the guiding principles that enable all response partners to prepare for and provide a unified national response to disasters and emergencies. It establishes a comprehensive, national, all-hazards approach to domestic incident response. EgyptAir Flight 990 NTSB Report - National Transportation Safety Board (NTSB) investigation of the crash of EgyptAir Flight 990 which ocurred on October 31, 1999. Embassy Bombings in Nairobi and Dar Es Salaam - U.S. Report of the Accountability Review Boards on the Embassy Bombings in Nairobi and Dar es Salaam, released January 8, 1999. The bombings took place ion August 7, 1998. Evolution of Islamic Terrorism - An overview, published on PBS's Frontline website. Written by John Moore. Embassy of US, London - UK: Specific Terrorism Issues - Documents and resources selected by the Public Affairs Section, American Embassy, London, from the daily Washington File and other U.S. Government sources. FAIR: Terrorism - Fairness and Accuracy in Reporting resources. FBI Terrorist Screening Center - Maintains the U.S. government's consolidated Terrorist Watchlist-a single database of identifying information about those known or reasonably suspected of being involved in terrorist activity. Federal Bureau of Investigation Guide to Concealable Weapons 2003 (.pdf) - Information on a collection of knives that otherwise may be dismissed as nonthreatening. These 'knives' are all designed to cut and are fully functional in that respect. As such, they are treated as potentially dangerous weapons. Each knife is shown with an accompanying scale for size reference and many include an X-ray photograph to show how these weapons might appear if laced in luggage and passed through a scanning device. Federation of American Scientists (FAS): Terrorism - Background and threat assessments - a selection of resources on the threat of terrorism and options for responding to it. FEMA: Terrorism - Backgrounders on what to do before, during, after a terrorist attack and terrorism factsheet. Provided by the U.S. Federal Energency Management Agency (FEMA). Flight 800 Investigation - Maintains that TWA Flight 800 could have been shot down by one or more shoulder-fired missiles. Gareth Peirce - An English solicitor, educated at the Cheltenham Ladies' College, the University of Oxford and the London School of Economics. She is known for her work in high profile cases representing people with Irish and Muslim backgrounds accused of terrorism. Gilmore Commission Reports on Weapons of Mass Destruction - Assessments of the capabilities for responding to terrorist incidents in the U.S. homeland involving weapons of mass destruction. Global Terrorism Database (GTD) - An open-source database including information on terrorist events around the world from 1970 through 2011 (with annual updates planned for the future). Unlike many other event databases, the GTD includes systematic data on domestic as well as international terrorist incidents that have occurred during this time period and includes more than 104,000 cases. Hart-Rudman Commission Reports - The United States Commission on National Security/21st Century, also know as the Hart-Rudman Commission, was chartered to review in a comprehensive way U.S. national security requirements for the next century. Its reports are archived here in .pdf format. History X ISIS - Information about IS/ISIS. INCORE: Conflict Data Service (CDS) - Entry point to an information network in the field of Conflict Resolution and Ethnicity. Targeted audience includes: academics and others who are researching ethnic conflict, particularly those who live in conflict areas; policy makers, especially in the United Nations system; mediation practitioners in conflict areas; and the media. Individual Preparedness and Response to Chemical, Radiological, Nuclear, and Biological Terrorist Attacks: A Quick Guide - A RAND publication available free online. Institute for Counter-Terrorism (ICT) - Terrorism and counter-terrorism: articles, news, commentary, links. Intelwire - Terrorism and law enforcement news, investigative reports and primary source documents. International Policy Institute for Counter-Terrorism (ICT) - An Israeli research institute and think tank dedicated to developing public policy solutions to international terrorism. International Relations and Security Network (ISN): Extremism/Terrorism - Links collection. ISE - Provides analysts, operators, and investigators with integrated and synthesized terrorism, weapons of mass destruction, and homeland security information. Jaish-e-Mohammed - Literally The Army of Mohammad, a major Islamic terrorist organization in South Asia. Jaish-e-Mohammed was formed in 1994 and is based in the Islamic Republic of Pakistan. The group's primary motive is to separate Kashmir from India and have carried out a series of terrorist attacks all over India. Jamestown Organization - Information from Eurasian, Asian, Chinese world of terrorism. Jane's Security Intelligence Solutions - Ultimate source for information in the world on the subjects of defence, geopolitics, transport, security, and police. Also see Jane's Terrorism and Insurgency Centre. Jenkins, Brian Michaels - Expert on terrorism and transportation security. this site provides RAND publications written by Jenkins. Jihad Intel - Intelligence on Islamic terrorist organizations. Also see the Jihad Identifiers Database. Jihad Watch - Robert Spencer. Lashkar-e-Taiba - Literally Army of the Good, commonly translated as Army of the Righteous; one of the largest and most active terrorist organizations in South Asia. It was founded by Hafiz Muhammad Saeed in the Kunar province of Afghanistan, and is currently based near Lahore, Pakistan operating several militant training camps in Pakistan-administered Kashmir. Lashkar-e-Taiba members have carried out major attacks against India and its primary objective is to end Indian rule in Kashmir. Liberation Movements, Terrorist Organizations, Substance Cartels, and Other Para-State Entities - Listing and informaiton provided by the Federation of American Scientists (FAS). List of Terrorist Incidents - From Wikipedia, a timeline of acts and attempted acts that have been labelled as "terrorism" and are not believed to have been carried out by a government or its forces (see state terrorism and state-sponsored terrorism). Assassinations are listed at List of Assassinated People. Ma'alim fi-l-Tariq (Milestones) - Sayyid Qutb's manifesto of political Islam. MEMRI Jihad and Terrorism Threat Monitor (JTTM) - Scrutinizes Islamist terrorism and violent extremism worldwide, with special focus on activity within and emanating from the Arab world, Pakistan, Afghanistan, and Iran. MIPT: Terrorism Knowledge Base - In-depth information on terrorist incidents, groups, and trials. National Academies Reports on Terrorism and Security - Recent publications from the National Academies about the science and policy issues surrounding terrorism and security. National Commission on Terrorism: Countering the Changing Threat of International Terrorism - Report submitted to U.S. president on June 7, 2000. The Commission was chaired by Ambassador L. Paul Bremer, III. (S). National Consortium for the Study of Terrorism and Responses to Terrorism (START) - Tasked by the Department of Homeland Security's Science and Technology Directorate with using state-of-the-art theories, methods, and data from the social and behavioral sciences to improve understanding of the origins, dynamics, and social and psychological impacts of terrorism. START, based at the University of Maryland, College Park, aims to provide timely guidance on how to disrupt terrorist networks, reduce the incidence of terrorism, and enhance the resilience of U.S. society in the face of the terrorist threat. Also see START's Global Terrorism Database. National Counterterrorism Center (NCTC) - Established by Presidential Executive Order 13354 in August 2004, and codified by the Intelligence Reform and Terrorism Prevention Act of 2004 (IRTPA). NCTC implements a key recommendation of the 9/11 Commission: "Breaking the older mold of national government organizations, this NCTC should be a center for joint operational planning and joint intelligence, staffed by personnel from the various agencies." National Security Archive Online Readers on Terrorism, Intelligence and the Next War - This site provides documents, some of which were obtained under the Freedom of Information Act, that include assessments of the terrorist threat to the U.S., a CIA profile of Usama bin Ladin, presidential and Defense Department policy directives, details about U.S. response to specific terrorist attacks, and evaluations of U.S. government preparedness to deal with terrorism. Nuclear Control Institute (NCI): Nuclear Terrorism - Information, books, papers, reports related to the prevention of nuclear terrorism presented by the NCI. Nuclear Threat Intitiative - Ted Turner and Sam Nunn joined together to create the Nuclear Threat Initiative (NTI), a charitable organization working to reduce the risk of use and prevent the spread of weapons of mass destruction. NTI has brought together international experts with different views and experience who share a common goal of taking immediate action to close the gap between the global threat and the response. Office of Foreign Assets Control (OFAC) - U.S. Department of Treasury agency administers and enforces economic and trade sanctions based on US foreign policy and national security goals against targeted foreign countries, terrorists, international narcotics traffickers, and those engaged in activities related to the proliferation of weapons of mass destruction. OFAC acts under Presidential wartime and national emergency powers, as well as authority granted by specific legislation, to impose controls on transactions and freeze foreign assets under US jurisdiction. Many of the sanctions are based on United Nations and other international mandates, are multilateral in scope, and involve close cooperation with allied governments. Also see: Civil Penalties and Enforcement Information. Operation Kratos - The code word used by the Anti-Terrorist Branch (SO13) of London's Metropolitan Police Service to refer to policies surrounding and including "shoot-to-kill" tactics to be used in dealing with suspected terrorists and suicide bombers. The tactics were developed shortly after the September 11, 2001 attacks, and are understood to be based in part on consultation with Israeli and Sri Lankan law enforcement agencies on how to deal with "deadly and determined" attackers. Little has been revealed publicly and officially about the policies, which were apparently first activated after the bombings of July 7, 2005 in London, and were only exercised in the mistaken shooting of Jean Charles de Menezes on July 22 2005. People's Mojahedin Organization of Iran - Exile-Iranian organization that advocates the overthrow of the Islamic Republic of Iran. Also see Wikipedia and START backgrounders. Perspectives on Terrorism - Perspectives on terrorism is a journal of the Terrorism Research Initiative. It provides an interactive publishing platform for an international community of terrorism experts. Project on Extrajudicial Executions - Established to conduct research into international legal regimes protecting the right to life and to support the work of the Special Rapporteur on extrajudicial, summary or arbitrary executions in carrying out his mandate. The Project is directed by William Abresch. Phil Shiner - Leads the team at Public Interest Lawyers, currently acting for over 130 former detainees who allege that they or their family members were unlawfully detained, ill-treated, or killed by UK Forces in Iraq. Ready.gov - Resources and advice on preparing for terrorist attacks. Provided by the U.S. Department of Homeland Security. SITE Intelligence Group - Research and analysis of terrorist networks, including monitoring jihadist propaganda, studying trends within the online jihadist community, and understanding how jihadist groups utilize the Internet. South Asia Terrorism Portal - Information, data, commentary, research, critical assessment and analysis on terrorism, low intensity warfare and sectarian strife in South Asia. Special Operations.com: Foreign Terrorist Organizations - Alphabetical listing and descriptions. Study of Terrorism and Responses to Terrorism (START) - A University of Maryland-based research and education center comprised of an international network of scholars committed to the scientific study of the causes and human consequences of terrorism in the United States and around the world. Target America - PBS Frontline explores the story of the first war on terrorism, fight against terrorists in the 1980s during the Reagan administration. This report examines the military responses to terrorism, the diplomatic maneuvering to terrorism and the internal policy struggles within the Reagan White House--and the lessons to be drawn from these counterterrorist battles. Target America: The Evolution of Islamic Terrorism - From PBS Frontline, a closer look at how modern terrorism has evolved in the Middle East and South Asia. Terrorism and Security Collection - Twenty-five (25) recent publications from the National Academies about the science and policy issues surrounding terrorism and security. Full-text searchable. Terrorism and U.S. Policy - A National Security Archive briefing book. Documents, some of which were obtained under the Freedom of Information Act, include assessments of a terrorist threat and a CIA profile of Usama bin Ladin, presidential and Defense Department policy directives, details about U.S. response to specific terrorist attacks, and evaluations of U.S. government preparedness to deal with terrorism. Terrorism, Anti-Terrorism, Taliban and and Afghanistan Links - Terrorism, anti-terrorism, Taliban, and Afghanistan research links. Terrorism in South Asia (.pdf) - CRS report for Congress, 08 Mar 2004. Terrorism in the U.S. - FBI reports and publications. Terrorism Intelligence Threat Assessments - U.S. government terrorism operations plans, reports, and related resources provided by the Federation of American Scientists (FAS). Terrorism: Background on Chemical, Biological, and Toxin Weapons and Options for Lessening Their Impact (.pdf) - CRS Report for Congress dated 01 Dec 2004. This report provides a general overview of chemical, biological, and toxin weapons and their treatment; a summary of why some of these weapons may be more attractive to terrorist groups than conventional weapons; select aspects of the current response against chemical, biological and toxin terrorism; and potential options towards lessening these weapons' impact. Terrorism: Near Eastern Groups and State Spnosors, 2001 - This report is an annual analysis of Near eastern terrorist groups and countries on the U.S."terrorism list," a list of countries that the U.S. Secretary of Commerce and Secretary of State determine provide repeated support for international terrorism. Terrorism Preparedness - The links and downloads presented here are designed to educate and prepare the reader for terrorist events and other non-natural disasters such as chemical and nuclear releases. This site focuses on materials and links that will aid planners and emergency responders in preparedness, planning, recovery, medical and response issues. Terrorist and Insurgent Organizations - Links to background information on terrorist organizations. Terrorist Groups - Compiled by National Counterterrorism Center. Terrorist Organization Profiles - Presents data through March 2008. 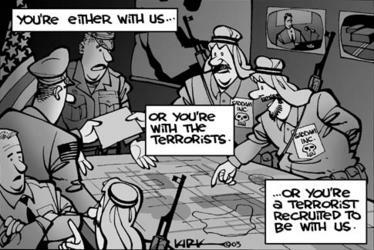 Terrorist Screening Center - "Prior to the creation of the TSDB, information about known or suspected terrorists was dispersed throughout the U.S. Government and no one agency was charged with consolidating it and making it available for use in terrorist screening. Under Homeland Security Presidential Directive (HSPD) 6, the Terrorist Screening Center (TSC) now provides "one-stop shopping" so that every government screener is using the same terrorist watchlist-whether it is an airport screener, an embassy official issuing visas overseas, or a state or local law enforcement officer on the street. The TSC allows government agencies to run name checks against the same comprehensive list with the most accurate, up-to-date information about known and suspected terrorists." Also see SourceWatch and ACLU Terrorism Watch List Counter. Terrorist Threat Integration Center (TTIC) - FAS backgrounder: The TTIC is an interagency body intended "to provide a comprehensive, all-source-based picture of potential terrorist threats to U.S. interests.TTIC is comprised of elements of the Department of Homeland Security, the FBI's Counterterrorism Division, the DCI's Counterterrorist Center, the Department of Defense, and other U.S. government agencies. Transportation Security Administration (TSA) - Responsible for security at the U.S.
Tri-Valley CAREs (Communities Against a Radioactive Environment) - A citizens group opposed to the flagrant environmental pollution and wasteful spending of nuclear weapons labs in Livermore, California and Sandia, New Mexico. Trial and Terror - The U.S. government has prosecuted hundreds of people for terrorism since the 9/11 attacks. Most of them never even got close to committing an act of violence. This database of terrorism prosecutions and sentencing information, is maintained and updated by The Intercept, was created using public records. UC Berkeley Experts on Terrorist-Related Topics - Experts at the University of California, Berkeley, available to speak with reporters on a variety of topics related to the Tuesday, Sept. 11, devastation including the World Trade Center's structural system, airport security, national security, and the disaster's emotional impact are listed on this page. UN Action Against Terrorism - United Nations response to terrorism. Activities and latest developments. Also see the United Nation's Office for Drug Control and Crime Prevention (ODCCP) site's section on Terrorism Prevention. UN Office on Drugs and Crime (UNODC) - Addresses issues of drug control, crime prevention, and international terrorism. 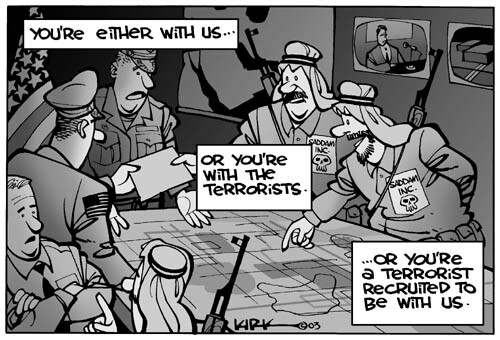 U.S. Army War College: Terrorism - Research, reports, student papers. Counterterrorism Office - Coordinates all U.S. Government efforts to improve counterterrorism cooperation with foreign governments. The Coordinator has primary responsibility for developing, coordinating, and implementing American counterterrorism policy. Foreign Terrorist Organizations (FTO) - FTOs are foreign organizations that are designated by the Secretary of State in accordance with section 219 of the Immigration and Nationality Act (INA), as amended. Office of the Coordinator for Counterterrorism - This State Department web site is a permanent electronic archive of information released prior to January 20, 2001. Reports on Assistance Related to International Terrorism - This report is submitted pursuant to the requirements for a congressionally mandated annual report codified at 22 U.S.C. § 2349aa-7(b). U.S. government provids assistance related to international terrorism through the Departments of State, Homeland Security, Justice, and Treasury, and the Federal Deposit Insurance Corporation, and other agencies. This report does not include assistance related to international terrorism provided through the Department of Defense. U.S. Treasury: Office of Terrorism and Financial Intelligence (TFI) - Marshals the department's intelligence and enforcement functions with the twin aims of safeguarding the financial system against illicit use and combating rogue nations, terrorist facilitators, money launderers, drug kingpins, and other national security threats. Union of Concerned Scientists - Learn about efforts to make the world safe from nuclear arms, the programs that undermine it, such as national missile defense, and the work of the Union of Concerned Scientists in this area. USS Cole - Investigatigative reports, information and resources concerning the terrorist attack on the USS Cole that ocurred October 12, 2000. World Trade Center Bombing in 1993 - ccurred on February 26, 1993, when a truck bomb was detonated below the North Tower of the World Trade Center in New York City. The 1,336 lb (606 kg) urea nitrate-hydrogen gas enhanced device was intended to knock the North Tower (Tower One) into the South Tower (Tower Two), bringing both towers down and killing thousands of people. It failed to do so, but did kill six people and injured thousands. This webpage last updated on Thursday, July 6, 2017 8:15 PM.